Granola doesn’t last very long around Living Kitchen HQ. We love it so much that we could eat it for every meal (alright, maybe we’re exaggerating a little bit). While oats are packed with heart-healthy soluble fibre that makes for a satiating breakfast, store-bought versions are often high in sugar – around 12.5 grams per cup according to The Guardian. Eating this first thing in the morning can absolutely be a recipe for a massive energy spike and crash later in the day. 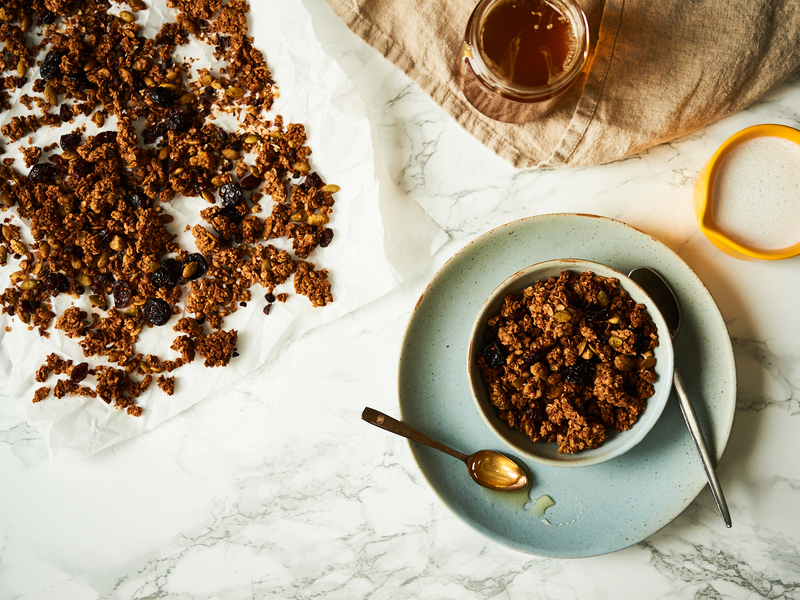 Homemade granola is definitely the best option if you’re looking to control your sugar intake. It is easy to prepare a large batch on Sundays to use for grab-and-go breakfasts or snacks. Prioritize loading it up with healthy fats from nut butter and seeds, adding sweetness with honey or unsweetened dried fruit. We created these crunchy granola clusters that are packed with cacao, peanut butter, and dried cherries. It is light on sweetness with only a touch of raw wildflower honey from Beekeeper’s Naturals. The best part? It’s completely adaptable and you can modify our recipe to include the things you love. Plus we have an awesome cooking technique that you can use to get nice crunchy clusters! 1. Preheat oven to 300 F.
2. Combine all dry ingredients together in a small bowl. In a small pot over medium-low heat combine peanut butter, raw honey, and coconut oil until completely glossy and smooth. 3. Mix together the wet and dry ingredients until completely coated and spread evenly on a silpat or parchment lined baking sheet. 4. Bake for 30-35 minutes until golden brown, rotating the pan halfway through the cooking time. Do not stir it (trust us). 5. Place on a cooling rack, allowing to cool completely to the touch. Once cool, break into large cluster sized pieces and mix with additional toppings. 6. Store in an airtight glass container or mason jar. 7. Serve on top of yogurt, or with a splash of coconut milk and a drizzle of raw honey. Let us know what your favourite granola toppings are over on our Instagram page. While you’re there, don’t forget to enter our Spring Snack Giveaway where you can enter to win a jar of raw wildflower honey from Beekeeper’s Naturals.